I love how this Ricotta Stuffed Baked Pear Halves in Chocolate Pie Crust and a Rosemary Glaze recipe both showcases and transforms a simple baked pear dessert into an elegant creation. This was such a fun recipe to come up with. I bet you are wondering what was the inspiration for my Ricotta Stuffed Baked Pear Halves in Chocolate Pie Crust and a Rosemary Glaze. Well, I was torn between going for fresh pear recipes or cooked pear recipes. I wanted to preserve the fruit as much as possible, but really have fun with it. I saw the idea of individually baked pies like this but using a basic pie crust sounded boring. Chocolate and pears mary so well, so I chose a chocolate pie crust. it’s just a little pie crust too, so I am filing it under healthy pear recipes, right lol? To finish it off, just fill the cavity with a little bit of sweetened ricotta cheese and drizzle with rosemary glaze. The recipe may sound elaborate but trust me, this is a very easy pear dessert to prepare. Nowadays you can get just about any fruit year round but have you seen where they come from? They have traveled, they were picked before even being ripe and are often plumped up with water. In summer we should always prioritize local produce. And to not miss out on the local bounty it is very important to know when your favorite fruits and veggies are in season. 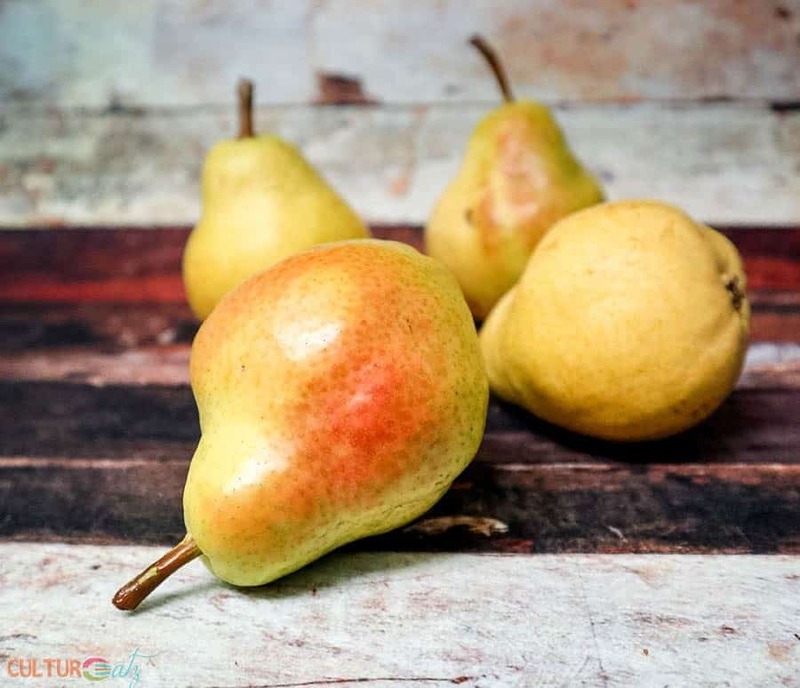 You can find California Bartlett Pears from about mid-July to August, although they are harvested through mid-September. California Bartlett Pears come about 60 small family farms, which are leaders in natural pest control and fertilizer reduction. Start by picking a well-shaped and firm fruit with a smooth skin that is free of surface markings. Minor blemishes are fine. Be gentle on the way home from the store as ripe pears can bruise easily. Is your pear ripe? Gently push the stem on the top into the pear. If it gives way a little, then it’s ripe. If the pears are not ripe, the best way to ripen them is simply by leaving them in a fruit bowl at room temperature for four to six days. Bartlett pears will turn from green to a golden yellow. At this point, if you are not ready to eat them, place them in your refrigerator and use within a couple of days. Pears contain a mere 100 calories approximately! They make for a perfect snack or meal treat. Did you know that pears are full of antioxidants and they are a good source of fiber? A pear also contains lost of Vitamin C, potassium and folic acid. 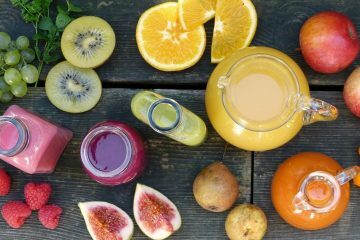 For information and recipes visit www.calpear.com and check out their social media on Twitter, Pinterest, Facebook, and Instagram. Did I ever tell you it took me years to make a decent simple pie crust? It’s true, I did not know the secrets of making pie crust, the tips to success for the best pie crust. I will share them with you now. The perfect pie crust requires very cold butter cut into cubes, ice cold water, as little manipulation as possible, and it needs to rest in the fridge for a bit. A butter pie crust rules. I know there are vegan options and all out there, but butter is king here. You will want to cut your butter in the flour mix until you get a coarse cornmeal texture. For a no fail pie crust, use a food processor for this step. Once you have the right texture, add 1 tablespoon of ice cold water at a time, until it comes into a ball. Shape into a disk, wrap in plastic and refrigerate for about 30 minutes. 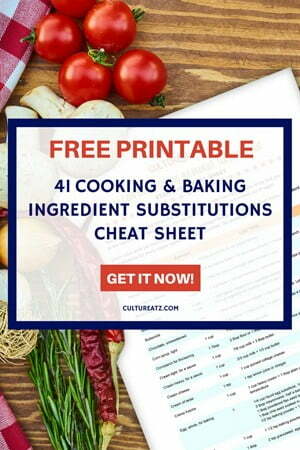 Remove the refrigerated pie crust from the fridge and roll out as needed. If you have a top crust, make sure to prepare an egg wash for the pie crust to get a nice sheen. As I searched for pear recipes and how to cook pears, I just wanted to keep the actual pear as intact as possible, really showcasing the Bartlett pear. I was very tempted to make easy poached pears in wine, so good, but I fell on the concept of healthy baked pear halves wrapped in a buttery flaky pie crust, a chocolate pie crust at that. 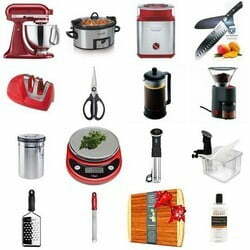 But you could make it with a plain homemade pie crust dough, ready made pie crust, or a frozen pie crust dough. The pears are peeled, halved and the middle core removed. Placing them face down on a baking sheet, the outside is covered with a square of our pie crust. if you have leftover pie crust you could shape little leaves and attach it to the base of the pear. Then we bake the fruit. 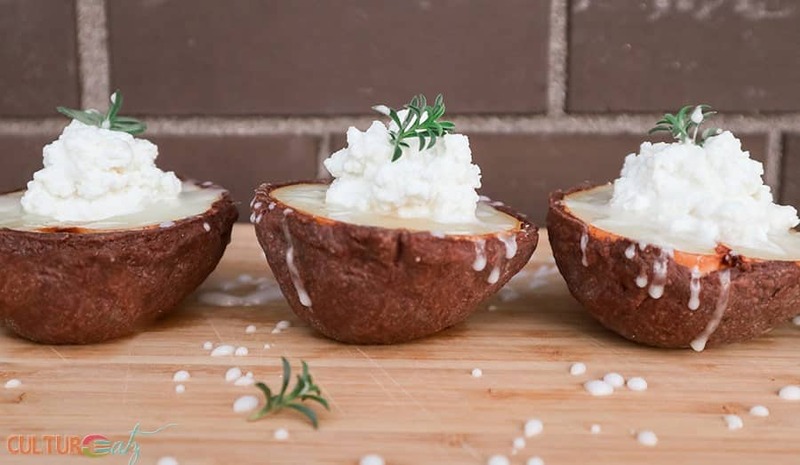 Once the baked pear halves have cooled, place 2 tablespoons of sweetened ricotta in a mound in the cavity. And the piece de résiitance, make your rosemary glaze and drizzle over the half pear pies. We are basically making a small amount of cake glaze. In contrast, most drizzled pears online are done with caramel but I wanted something more unique. I could have made an orange glaze recipe or even a vanilla glaze. I thought of using a herb and rosemary recipes came to mind right away. 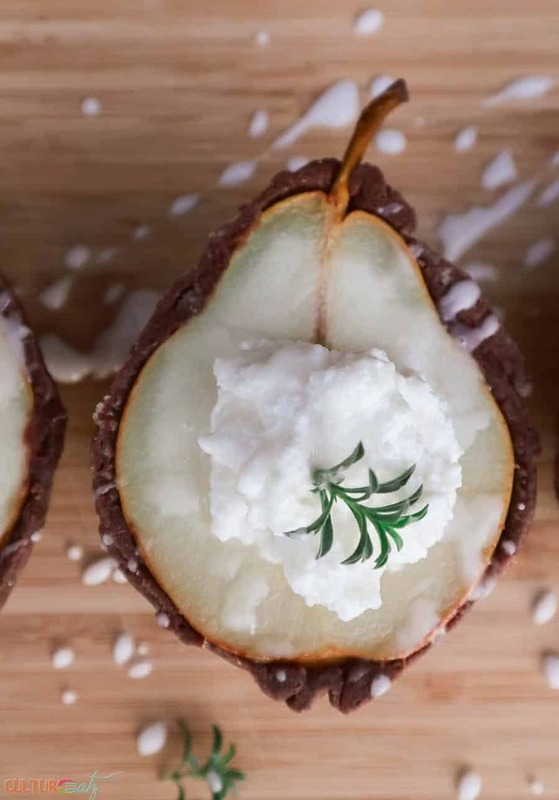 Turnout out rosemary pairs well with both chocolate and pears. It’s really the final elegant touch. As you can see, this is a quick pear dessert to make even if they look fancy pastry shop worthy. If you have fresh rosemary on hand, I suggest topping the ricotta mound with a touch of rosemary for extra oomph for presentation. In a food processor, add the flour, cocoa, sugar, salt, and butter, and pulse until you get a crumb texture. Add one tablespoon of the cold water at a time, pulsing after each addition, until you get large clumps and that the dough resembles coarse wet sand. Shape into a flat disc, wrap into plastic wrap, and refrigerate for at least 30 minutes. Preheat oven to 350°F. Halve pears, leaving the stems on. Scoop out the seeds and make a small hole (a melon baller works best ). Place the pears halves, face down, on a parchment-lined baking sheet. Roll out pie the pie dough until a 1/4" thick and divide into squares large enough to cover each pear half. Place on top of each pear half and shape into place. Cut any excess around the pears with a small knife. Cut small slits into the pie crust and the pears with the tip of the knife. Bake for about 20-30 minutes, or until the crust is golden and that you see juice bubbling out from pears. Let cool. Heat milk in the microwave until very warm with the sprig of rosemary cut into smaller sections, leave on the counter to steep for 10 minutes. Strain out the rosemary. In a small bowl, stir the sugar and enough milk together until smooth, adding just enough milk to achieve a drizzle consistency. 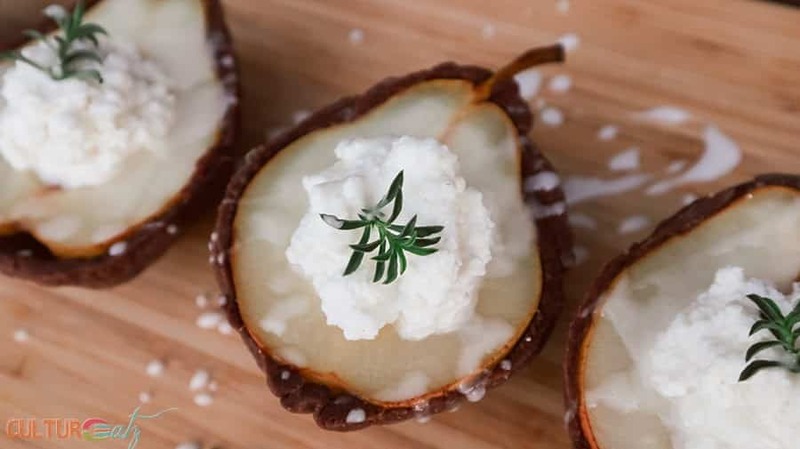 Flip the pears and fill the cavities with 2 tablespoons of sweetened ricotta and drizzle with the rosemary icing. To stop cut or sliced pears from browning, dip the exposed part into a mixture of 1 tablespoon (15 mL) lemon juice and 1 cup (250 mL) water. 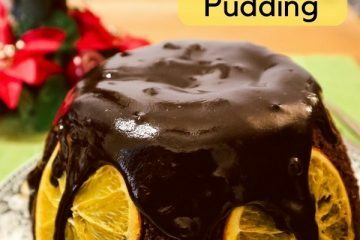 There are so many different layers to this recipe, I really like the sound of it and it would make a delicious dessert. From seeing what you make, yes I think this dessert would be right up your alley :-) Thank you so much! These. Sound. AMAZING! I'll have to try them out myself! You can't beat a delicious pear dessert!! Thank you so much Emma. Let me know how they turn out! 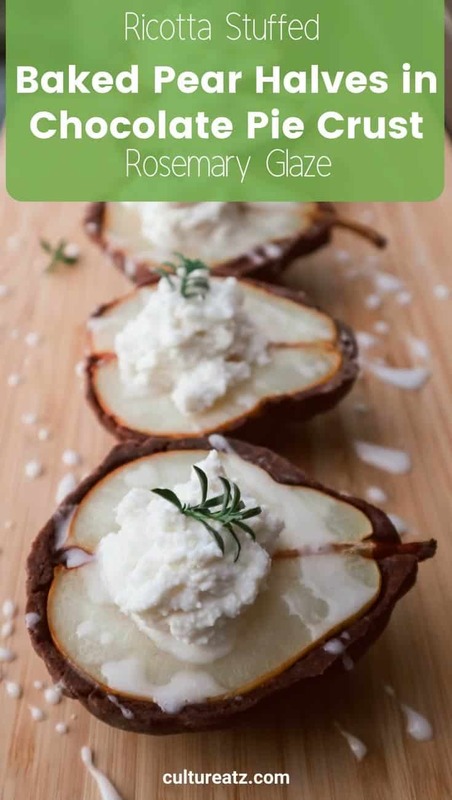 Great idea to combine pear and rosemary! I once enjoyed an artisan gelato with those flavors in Florence, Italy! Since I have a HUGE rosemary bush in my backyard, I like recipes that help me to use it! These sound yummy! I'm obsessed with apple stroodle and this sounds like a unique twist to that, I'll have to try it! Oh yeah you could totally swap pears for the apples. 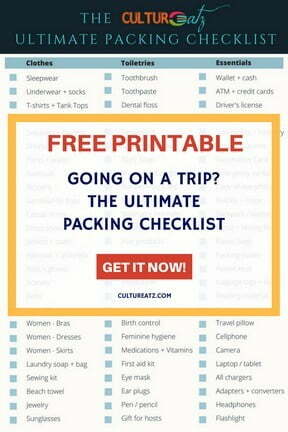 Let me know if you try it! I do love pear desserts and this sounds super yummy. When I lived in the Midwest we ate pears all the time, but they rarely have them in the grocery stores in Washington State. Not sure why, but I sure do miss eating fresh pears. Really, I a surprised to hear you don't see them much in grocery stores there? Farmer's markets? You could always try a can of half pears for this recipe in your case. Thanks Carrie. I love how fancy it looks but so easy to make! 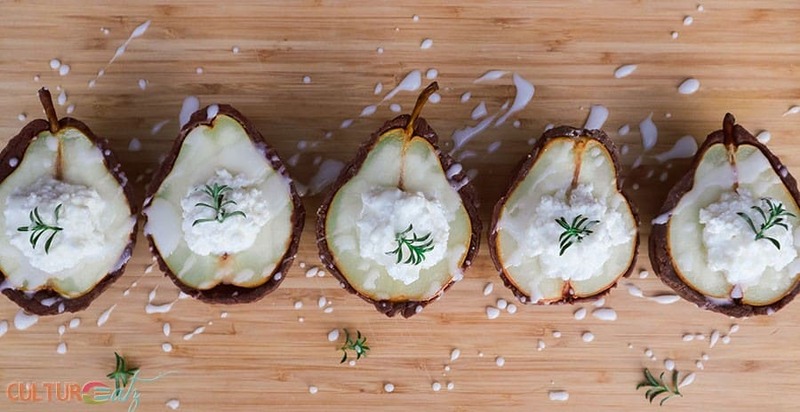 Neat way to use pears -- really creative. And with that crust, these are definitely health food. :-) Fun stuff -- thanks. Love the idea, they look absolutely gorgeous and I like the ratio of lots of pear to a little, delicious, chocolate pastry! Lovely recipe! I adore Bartlett pears and this is such a beautiful, elegant recipe! I didn't realize that California pears were available now--going to have to check the market! Thanks Lorraine, I was inspired enough to even turn on the oven during a heatwave lol. Fabulous!!!! No only are the flavors amazing, but the various textures make this even more appealing. Wonderful creation! Thank you so much MJ, it was a fun dessert to build. What beautiful and delicious treats! 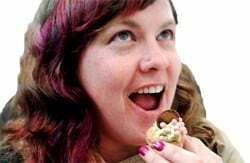 They are just like mini pear tarts...fun and delicious with the combo of flavours, Evelyne. Thank you so much Angie! These we super fun to create.